Does anyone know what’s hidden in the large ugly plastic boot on the FT857D’s power lead… Neither Yaesu’s service manual nor google seem to be able to help on this one, but surely someone out there’s had one apart! It will be a choke / capacitor filter block I guess. I think there is some similar in my IC706 power lead. It’s a large ugly plastic plug SOTA operators cut away. I wonder if it’s a Europe-only required filter - The iCOM IC-7300 comes with a metal box with a power filter in it, that apparently isn’t supplied with units in the US. This is the 13.8v DC supply, so I don’t see how this will be different on each side of the pond so I’m guessing it’s some EU regulation - perhaps this is the case with the “boot” in the FT857 lead as well - which isn’t in the offocial replacement lead that I gave the picture of, from a US retailer. 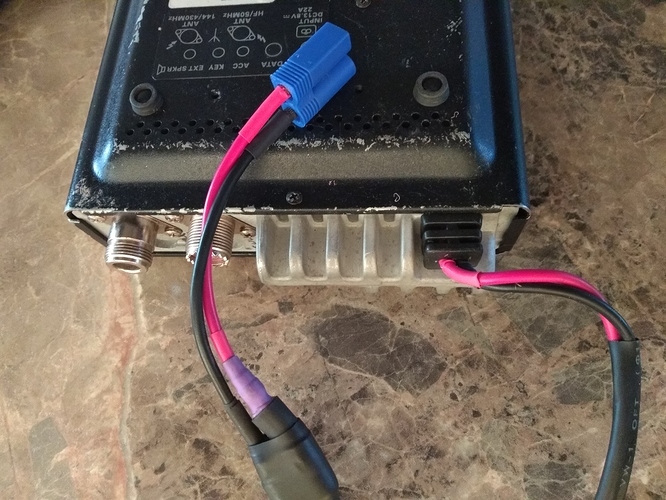 The boot is actually on the power lead emerging from the radio, rather than the “extension” lead with the in-line fuseholders. Not sure whether non-EU rigs are the same, but it’s pictured and identified in the official Yaesu Service Manual as “T9207026 WIRE ASSY” so I’m assuming it’s universal. Edit… just had a look at the pic of the assembly in the Service manual, it is different to the one fitted to my radio - much less bulbous and ungainly so maybe it is some kind of regional variation. Obvious really but I guess I could always ask the nice man who sold me the radio! AHA - so is it the white Molex connector that is inside the black bulge! That makes sense as there’s no space on the rear panel to fit a Molex socket! Hence the suggestion to add Anderson power poles instead. You should be able to slide the rubber off without cutting it I would have thought ?? Perhaps not. 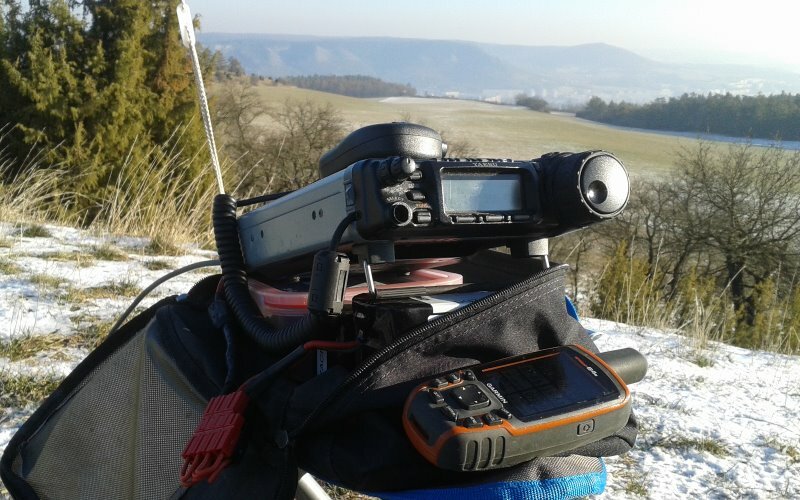 Coincidentally this is exactly what I did Pom last month on my 15 years old (June 2004) battered FT-857, that has done quite a few activations. I don’t use the radio in my shack. The power leads where they go into the grommet at the back of the radio were chafed and the conductors on both cores were starting to be exposed. The rig is unsaleable anyway due to its external condition and I wouldn’t want to sell it on anyway. I decided therefore to do away with the twin lead, booted connector and fuses completely! I’ll take the chance. Now there is less to go wrong. 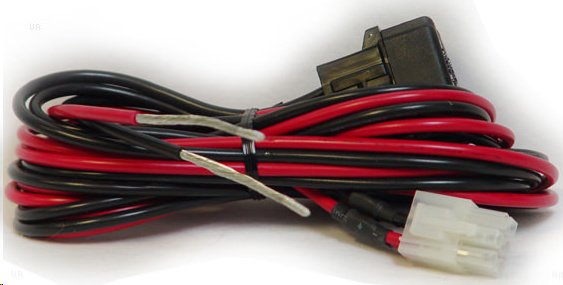 I found some substantial enough red and black power lead, drilled out the grommet - the orginal wires are moulded into it with heat I believe, so they wouldn’t just pull out. And I then resoldered the new wires on to the board inside and put some heat shrink sleeving either side of the grommet which should stop any strain on the power cable connections on the circuit board. The plug is now an RC5 radio control modellers plug which fits all the batteries that I use for /P work. OK Paul. The bulging plug and fuses went a few years ago after I got dodgy conenctions, cannot recall any ferrite within, just that white moulded plug protected by a boot. 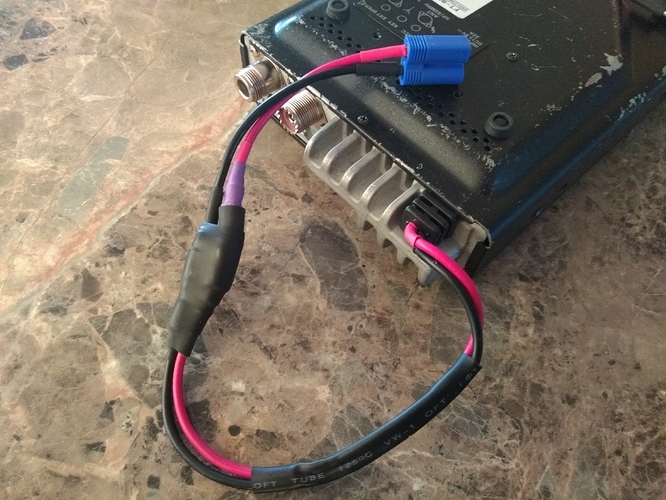 Wasn’t sure why Yaesu fit a twin lead - 2 reds and 2 blacks. There was also a thin brown wire, which went to ground on the circuit board. It didn’t connect to anything on the moulded plug, just went to a dead pin, so I removed that completely at the same time. Radio has had a hard life and doesn’t like it if the DC voltage from the battery drops much below 12 Volts, but it still works. Congratulations on getting the new radio! I think they double up the power wires to keep within the current rating of the plug contacts. The thin brown wire when grounded limits the output power to 20W (10W on 70cm). On eBay that’s a good condition radio, probably someone would ask £50 less than the new price for such a 15 year old set! Mainly because it is supposed to be hidden behind the dashboard of a car! All you need to know is in the diagrams on page 8 of the manual. Two 25 amp fuses which are useless but probably required by law in a vehicle installation. All you need to know is in the diagrams on page 8 of the manual. Sadly not Brian No mention of RF choking toroids built into the power lead in any resource I’ve been able to access. Even the picture of the plug (or is it actually the socket?) on P8 of my manual looks nothing like the large gobby item fitted. There’s no toroid in mine, Paul, perhaps its a recent innovation, my rig is about ten years old. It used to be Ford Pintos that were always on fire. Looks more like Vauxhall/Opels Zafiras with dicky heater/fan controls that spontaneously burst into flames. Yes. The negative lead fuse is important to protect in the event of a failure in the earth (negative) bonding in the car metal work when the radio is connected to both the positive and negative battery terminals.